The seventh edition of the International Contemporary Art Fair in Marbella, ‘Marb Art 2011’, will be open at the Palace of Congresses and Exhibitions of Marbella from Wednesday 14 until Sunday September 18. The event will feature works by 36 artists from around the world and aims to be a referential view of the latest art tendencies with the theme of lightness as common denominator. At Marb Art 2011, since its first edition the fundamental objective has always been to articulate a pluralistic meeting point where can coexist different forms of artistic media and forms; an expected appointment in the circuit of art collectors. Marb Art has led in recent years this fundamental communication for the world of art, creating a wide network and boosting the relationship between artists, gallery owners, collectors and all art enthusiasts. 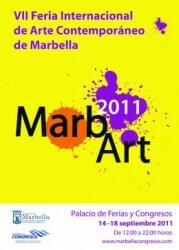 Marb Art 2011 is an opportunity to enjoy art and modern culture. Characterized by being very dynamic, the International Contemporary Art Fair in Marbella is one of the most important cultural events in the city. The Exhibition Hall of the Palace of Congresses will open at noon on Wednesday, September 14 and will close on Sunday, September 18.